Over the weekend, Governor Ducey attended the Comisión Sonora-Arizona/Arizona-Mexico Commission (CSA-AMC) 2018 Summit in Hermosillo, Sonora. 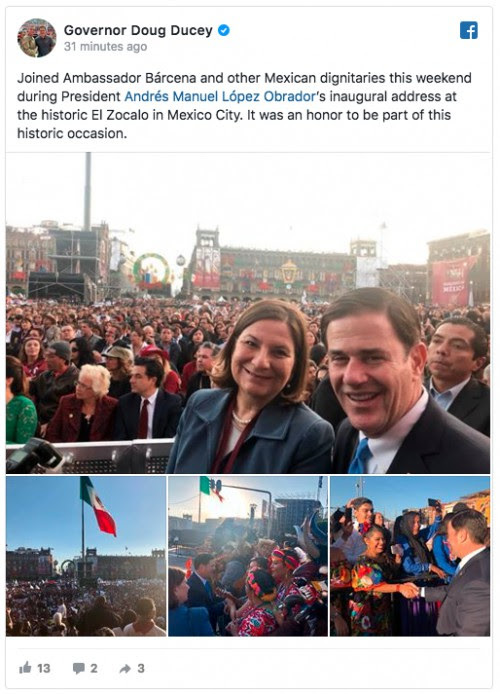 Following his visit to Hermosillo, Governor Ducey visited Mexico City to meet with elected officials and attend the inauguration of Mexican President Andrés Manuel López Obrador. Governor Ducey and Sonora Governor Claudia Pavlovich meet with the Agribusiness and Wildlife Committee during the 2018 CSA-AMC Summit. Governor Ducey and Governor Pavlovich sign three Memoranda of Understanding on economic development, cross-border education and emergency services. Read more HERE. Governor Ducey and Governor Pavlovich exchange gifts from their respective regions. Governor Ducey meets with the future Foreign Minister of Mexico Marcelo Ebrard. Governor Ducey speaks with Vice President Mike Pence, Senior White House Advisor Ivanka Trump, Secretary of Homeland Security Kirstjen Nielsen and Secretary of Energy Rick Perry before the inauguration of Mexican President Andrés Manuel López Obrador. 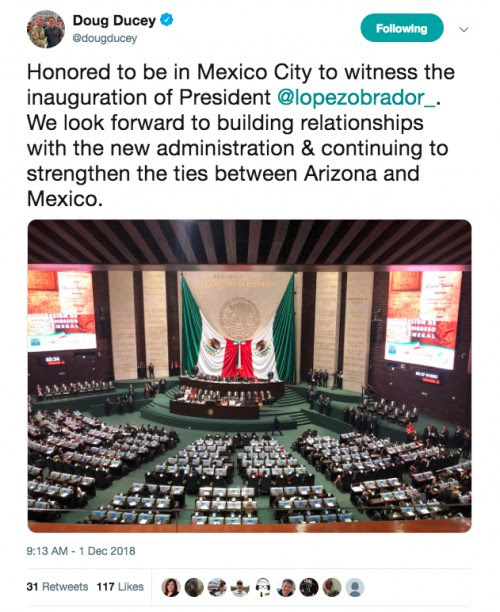 Governor Ducey attends the inauguration of Mexican President Andrés Manuel López Obrador. 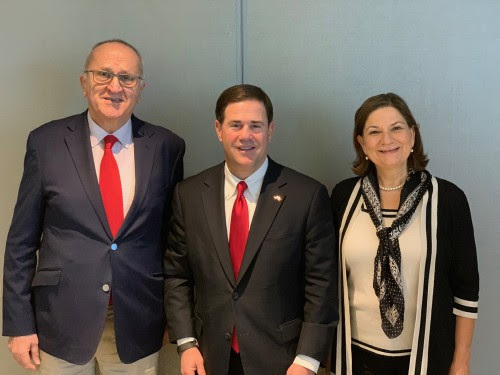 Governor Ducey meets with the Mexican Under Secretary for North America Jesus Seade and new Ambassador to the United States Martha Bárcena.